RYO Magazine has enjoyed a great deal of exposure and subsequent success during its nearly three years of life. We owe all of the above to our readers who arrive here from all segments of the fast-growing Roll Your Own / Make Your Own cigarette market, be they consumers, manufacturers, distributors, or retailers. We have established a reputation for honest and comprehensive evaluations of the products available from this branch of the tobacco industry. Perhaps more importantly we have worked diligently to sharpen the lines of distinction between those who make their own smokes using exceedingly high quality tobacco which is by nature nearly, if not completely, additive-free, and those who still suffer at the hands of chemical laden packaged cigarettes which are, in our opinion and the opinion of our readers, inferior in every way and designed with an emphasis that leads to obsessive use. 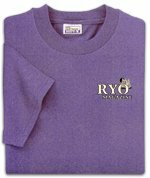 However, the concept of RYO goes far beyond the issue of tobacco. It truly involves the desire of most humans to choose paths of existence and pleasure as individuals rather than submit to the one-size-fits-all mentality most pre-packaged products including cigarettes often rely on for fiscal success. The spirit of individuality is a vital ingredient of any free society and in that spirit, RYO symbolizes freedom of choice, freedom of change, and most importantly, freedom from limitation. With these philosophies in mind and to address the request of so many of our readers, we have designed a limited edition T-Shirt. 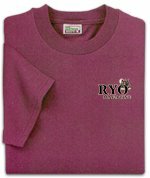 These shirts are not only beautiful and pertinent in design, but are of the highest quality. In keeping with our reverence for such standards we have chosen to use the Hanes "Beefy-T" and Anvil line of robust, high quality shirts. Below you will find the designs, colors and sizes available as well as links to purchase or get further information on this rather unique line of apparel. We have purposely kept the logo on the front of the shirt small and off-set to the left as we find T-Shirts with large, gaudy logos to lack style. In keeping with this less-is-more approach, the text on the back of each shirt is readable but not over stated in dimension. The logos, are shown below with a maroon background for display clarity only, while the logo stands alone on each shirt (i.e. no rectangular background). For relative size and logo color used on shirt front see shirt color samples further down. The design & text (cream or black also depending on shirt color) on each back, is shown immediately below and is approximately 6" in height. Each shirt sells for $16 including shipping to US customers aged 18 and over in all 50 states. Outside the US the cost is $18 (US $$) including shipping. US customers please allow a couple of weeks for delivery - a little longer for our readers in other countries. These delays will shorten once we begin to see size and color preference patterns emerge. Our intention was to create the classiest, most comfortable 100% cotton shirts possible. We know you will love them and your satisfaction is guaranteed. You'll look great wearing them while sending a subtle yet pertinent message to all. to reserve your shirt, e-mail us by clicking here. using our secure server by clicking the "Order Online Now" button below. personal checks by mail. No cash please. 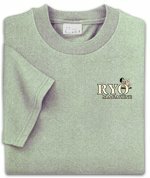 contact us at tshirts@ryomagazine.com for further instructions.